It is one of the most substantive speeches I’ve ever read by a Chinese leader, Robert Lawrence Kuhn, who has published a book about China’s economic reforms, told the New York Times. Point five said the government would allow some to get rich first. This was radical. After decades of isolation and outright hostility to capitalism, China suddenly began loosening state controls over the economy and encouraging its citizens to get rich. 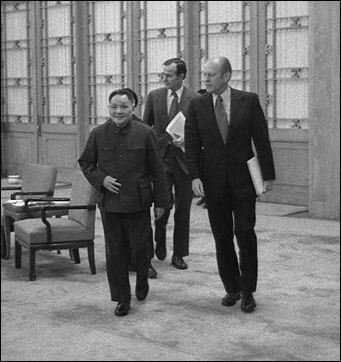 Deng with Ford and Bush In 1978, the 11th Central Committee of the Chinese Communist Party (CCP) held its third plenary session in Beijing from December 18 to 22. Deng Xiaoping, who had just made his third and last political comeback, delivered a keynote speech calling on officials and party members to “emancipate minds”. With that slogan, Deng sought to urge officials to break the ideological shackles of Maoist dogmas and the socialist command economy of the previous three decades and change their mindsets to embrace capitalist-style economic reforms. The meeting endorsed Deng as virtually the top leader of the party though officially he was only one of its “vice chairmen”. It also took up his ideas of reform and opening up of the economy as the party line, marking the party plenum as a milestone in the country's history. They played that gambling game all day. Some ended up losing money. They walked into my room and wanted to get a loan from me. I did “lend” some to them. You know they will never pay back.... The officials are so powerful, and can destroy you at a whim. The chief of the Religious Affairs Bureau shamelessly calls himself the parent of all gods. Deng was loyal to the Communist party and a firm believer in the "dictatorship of the proletariat." All major political decision had to be approved by Deng. He insisted that economic reforms could take palace without democracy, freedom, and political liberalizations and that power must remain firmly in the hands of the Communist Party. Deng feared that democracy might lead to the chaos and instability he endured during the Cultural Revolution. In 1978, he said, "Democracy has to be institutionalized and written into law, so as to make sure that institutions and laws don't change whenever the leadership changes, or whenever the leaders change their views or shift their focus." In 1983, Deng launched a "spiritual pollution" campaign in which petty criminals were taken off the streets and executed. During the "Democracy Wall" movement in Beijing, Deng ordered the posters and handbills torn down after critiques of the party were displayed. He also made it clear that allusions to a departure from the "socialist road" and use of the word "democracy" would be dealt with harshly. Despite all this Deng wanted desperately to modernize China and dispense with obsolete Marxist ideology. He declared that the Four Modernization (agriculture, industry, defense and science and technology) would take precedence over class struggle. As part of the policy new universities were opened and students were sent abroad for technical training. Diplomat Richard Holbrooke wrote in Time, Deng’s “opposition to superstition and ideology, plus his hostility to the Soviet Union, made him seem more liberal than he was. Deng did not believe his country could be governed democratically—at least not in this century." Henry Kissinger wrote in Newsweek that a recurrent theme in Deng's conversations "was the yearning for political stability and the fear that, once lost, it might not be regained for decades. And if stability was lost, he argued, the dream of a better life for the Chinese people and for a strong China would vanish as well." People's Daily: "Socialist Democracy: People’s Democracy Enjoyed by the Majority of the People"
People's Daily: "Bourgeois and Socialist Democracies Compared"
Deng ordered the massacre of students at Tiananmen Square and the clampdown on dissidents after the massacre. After Tiananmen Square, Schell wrote, "Deng's reputation as a sage of reform seemed damaged beyond repair. His extraordinary balancing act seemed to have come to an ignominious crash landing." 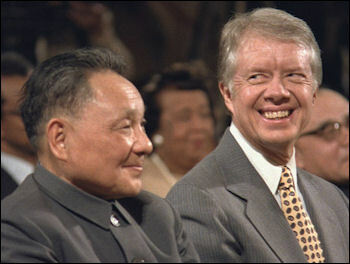 Deng was also behind efforts to suppress minorities in Tibet and western China. His government cracked down hard on pro-independence supporters in Tibet after protests in 1987. Martial law lasted for about two years. Each time the Tibetans revolted there were dealt a humiliating defeat. Chinese security forces were able to easily crush any Tibetan uprising. See See Articles on Tiananmen Square. Text Sources:Asia for Educators, Columbia University afe.easia.columbia.edu <|>; University of Washington’s Visual Sourcebook of Chinese Civilization, depts.washington.edu/chinaciv /=\; National Palace Museum, Taipei npm.gov.tw \=/ Library of Congress; New York Times; Washington Post; Los Angeles Times; China National Tourist Office (CNTO); Xinhua; China.org; China Daily; Japan News; Times of London; National Geographic; The New Yorker; Time; Newsweek; Reuters; Associated Press; Lonely Planet Guides; Compton’s Encyclopedia; Smithsonian magazine; The Guardian; Yomiuri Shimbun; AFP; Wikipedia; BBC. Many sources are cited at the end of the facts for which they are used.